Hi everybody, this is Typo. I’m writing this article to show you how to evaluate your own controller’s analog stick, and to clear the air about several other issues regarding controllers used for competitive Melee. Specifically, this article will serve as “Part 1” of a multiple-part guide that will cover all aspects of modding, fixing and repairing controllers. Most of the information presented here has been synthesized from both my own experience and the massive amount of information available from Kadano on Smashboards, Melee It On Me, and twitter (@Kadano). I’d highly recommend giving Kadano a follow and checking out his informative posts. Who is this article for? Anyone who wants to understand why their controller plays the way it does, or anyone who is in the market to buy a new one (particularly if it’s used). If you are wondering whether your controller is any good, or wondering why your friend’s controller plays better than yours, read on! NOTE: in this article, “dashback” is used interchangeably with “back dash” and “smash turn”. They refer to the same phenomenon. I’m also going to consistently use “great dashback” or “high-tier dashback” as my superlatives of choice, to avoid confusion. Controllers can vary significantly, especially when they are old. This means you have to be able to evaluate a controller accurately before deciding to use it (especially if you’re buying it). Alterations can be made to the buttons, triggers, and front shell, but the most important thing to pay attention to when testing a new controller is the analog stick. Specifically, your analog stick is crucial for mechanics such as dashing back and ledgedashing, along with some other minor input issues. Most analog stick problems cannot be fixed directly, so it’s important to “hunt” for a good circuit board and fix any minor negative characteristics such as worn out pads, sticky triggers, bad shield drop notches, or snapback. Unfortunately, replacing and switching analog sticks can get quite complicated and messy, so I would not recommend replacing an analog stick on a controller unless it is relatively new. Dashback, or back dash (or smash turn), occurs when you try to dash backwards from a standing animation. It does not occur while dash-dancing or dashing forward. Dashback is controller dependent to a certain extent, but can be influenced by “pre-accelerated inputs”, as we’ll discuss later. Hitting your dashbacks is a crucial element of high level movement, and many players choose to play the same controller for years simply because having high-tier dashback helps their movement so much (we’ll go over how to define “great” or “high-tier” dashback in a little bit). For simplicity’s sake, I use the terms “great dashback” and “high-tier dashback” to refer to controllers that have a 16/20 or higher success rate on dashing back. I’ll cover it in greater detail a little bit down the page in my section about testing dashback. Unfortunately, controllers with great dashback are often plagued by several problems that usually only occur on controllers with great dashback. If a controller does NOT have great dashback, it is not likely to develop any serious objective problems that cannot be fixed through general maintenance and repairs. In other words, great dashback is usually mechanically tied to other analog stick problems. The real challenge in finding a good analog stick is finding a controller that has great dashback without foregoing any other important mechanics such as ledgedashes or empty pivots. Fortunately, if an analog stick with bad dashback exhibits any of these other problems, it can easily be replaced by a brand new one which will probably perform better. This brings about an important question to consider: is the reward of having great dashback worth the risk of having a slightly “janky” controller? Some top players insist on finding controllers with great dashback, some players absolutely require great ledgedashes, but some players just need “a controller that works”. I personally believe that the risk/reward should encourage you to find the best controller possible, but the ability to capitalize on a great controller is dependent on overall skill. NOTE: My definition of “great dashback” implies that one is not using pre-accelerated inputs when attempting to dash backwards. Pre-accelerated inputs can be used in certain situations to get around a controller with inferior dashback, which is covered in depth in Kadano’s article about dashback. Snapback is an analog stick phenomenon where the stick slightly vibrates after returning to neutral from a “flick” input. Snapback usually only causes issues with aerial neutral B inputs, but it is indirectly linked to dashback as well. Essentially, an analog stick’s snapback can be used as a barometer to measure whether a controller has tier 1 dashback. The effective conclusion is that a controller with tier 1 or tier 2 dashback almost always will not be affected by snapback problems (we’ll discuss how to evaluate tier 1 dashback in the next section). Assessing snapback is easy: On the character select screen, move the cursor all the way to either the left or right side. Then “flick” the control stick towards the edge of the screen. A controller with snapback problems will move slightly backwards or tremble slightly, and a controller without snapback problems will remain stationary. It’s not 100% accurate, but usually serves as an easy litmus test for dashback. WARNING: A controller that has been treated with silicone grease for snapback will cause FALSE POSITIVES with this test. Use the following methods to perform more thorough testing. Method 1: Use the 20xx hackpack (either 3.02 or 4.05) to check with the frame counter or color overlays. This is the option I would recommend because it’s easy to set up, accurate, and provides a fairly objective diagnosis of a controller’s dashback. If you don’t know how to use the frame counter, check out Gravy’s short tutorial on YouTube. Use the frame counter to measure the time spent in the tilt turn animation (the 11 frame slow turn around animation that occurs when you tilt the stick backwards). It will display 1% if you get a good dashback, and 5-9% if you miss your dashback, depending on the character. You can also use color overlays in version 4.05 to set the tilt turn animation to be a contrasting color from the dash animation. Use the same steps to perform the test once you get a good idea of what to look for with the overlays. 1: Keep your thumb on the control stick in the neutral position. 2: Quickly move the control stick so your character dashes backwards from a standing position. 3: AVOID releasing the control stick until the entire animation is done. 4: Allow your character to return to a standing position. 5: Repeat in the other direction approximately 19 more times. Steps 1 and 3 are bolded because they are the most important things to do correctly in order to avoid false positives (or negatives) from inconsistent inputs. Fast fact: Fox and Falco always waste 4 frames when they miss their dashback, but marth and Falcon always waste 6. The value is the same every time you miss your dashback, but varies according to the character. Method 2: Use a vanilla setup and dash attacks. This method is less accurate and is more reliant on technique, so I’d only recommend you use it if you’re not able to test it with 20xx. Step 1: Pick Marth, Falcon, or another character that has a 7 frame missed dashback. Step 2: Keep your thumb on the control stick in the neutral position. Step 3: Try to do a dashback—->dash attack. Avoid doing a forward smash by accident. Step 4: AVOID releasing the control stick until the entire animation is done. Step 5: Repeat 19 more times. Again, step 2 and 4 are bolded to avoid false positives or negatives. A successful dashback will result in a dash attack as intended, but a failed dashback will result in a turn-around forward tilt with no dash. If you get a forward smash, it means you pressed A too soon after your dashback. These ranges are estimates based on averages of several sets of 20 attempts, and can vary according to human input error. Be sure to test thoroughly! There is always some element of RNG involved for reasons that are not completely understood, so the ranges are by definition merely estimates on my part. My experience suggests that there is a severe dropoff in a controller’s dashback ability after tier 3, which is why such a huge percentage of controllers display poor dashback. This severe dropoff, in my estimation, is correlated to the snapback test. Also, I would say that most variation between analog sticks within tier 4 has mainly to do with physical elements of the stickbox, as opposed to the potentiometers (which is widely considered to be the cause of tier 1-3 dashback). Brand new controllers usually come with tier 4 dashback until they have been broken in. However, breaking in a controller does not guarantee that its dashback will improve (and may even cause it to become worse). To make matters worse, a controller with high tier dashback may lose it after a long period of use (6-12 months). Manipulating the potentiometers or replacing the stickbox is a near-guaranteed way to lose your dashback, so if your controller has tier 1 dashback I highly suggest you only open it if absolutely necessary. In my opinion, controllers with tier 3 dashback and higher are suitable for high-level competitive play. You can still perform very well on a controller with tier 4 dashback, but in that case I would encourage you to break in a new controller in the hopes of getting one that deveops higher dashback. We’ll cover this in a later section, but some controllers with great dashback have problems letting go of the ledge, causing unwanted ledge jumps or ledge-stands. There’s some stuff you can do to get around it, but for the most part it’s the most serious issue that affects controllers with great dashback. This won’t affect you if you use the “frame perfect” or “quarter-circle” method of pivoting, but can still be a bit disconcerting to a player who expects all controllers to be able to empty pivot on demand. Somewhat rare and probably the hardest quality to define, you might find yourself getting accidental dash attacks, smashes, or tilts. Dashback out of crouch is unrelated to regular dashback, but missing your dashback out of crouch could mess with certain reaction techchase setups. inferior dashback. Most of the time, these 4 problems are unable to be fixed reliably. However, things like sticky light shields, shield drops, and snapback reduction can be fixed on nearly every controller, regardless of dashback. An in-depth discussion of these 4 problems follows. The reason why this information only applies to tier 1-3 dashback controllers is because a controller with tier 3 or lower dashback is unlikely to develop these kinds of issues. However, tier 3 is rare and you might as well buy a new controller if it’s below tier 3 (see discussion above). Nevertheless, read on to find out information about what can go wrong if a controller has great dashback. If your controller has tier 1-3 dashback, it is much more likely to have problems with ledgedashes. Specifically, a controller with bad ledgedashes will fail to release the ledge properly. This property is EXTREMELY difficult to measure, and seems to vary quite a bit depending on the player’s technique. Because good dashback is essentially a minor glitch in the potentiometers, it can interfere with the analog stick’s behavior on the ledge. If you find yourself doing a lot of “tournament winners”, or you get random regular getups, that’s a sign that the ledgedashes are off. In some cases, hitting backwards to drop off the ledge can cause you to do the regular getup, or pressing downwards to let go may simply may not doing anything at all. Be sure to practice ledgedashes regularly, because the better you are at ledgedashing the easier it is to diagnose problems! One good way of checking the ledgedashes is to do “A/B” testing with a controller that you know DOESN’T have good dashback. This gives a decent “control” value, because controllers with lower-tier dashback are much less likely to exhibit ledgedash problems. 1: Make sure the control stick is at dead neutral at the very moment you grab the ledge. 3: Use a “tilt” input to let go of the ledge instead of a smash input. The amount of tilt needed to drop off the ledge will be lower in these kinds of controllers. NOTE: if you get randy airdodge suicides, it’s most likely a timing issue. The only defining symptoms of bad ledgedashes are accidental jumps and ledge-stands. potentiometer, the same principle can slightly affect other slight control stick inputs such as tilts, jumps, throws, or smashes. As with ledgedashes, you should compare a controller with great dashback to a controller known to have bad dashback to get an idea of the extent of the weird inputs (if they exist). Some quirks may pose different problems to different characters or players, so someone else might love a controller you can’t stand. When testing, pay attention to slight technical errors, and repeat any sequences or techniques that seem to behave differently on the controller with great dashback. Finally, check later sections of my guide to make certain the issues you’re seeing cannot be fixed (such as the c-stick problem, etc). around at all. Once again, a great way to test this is by doing an “A/B” test with a controller that DOESN’T have tier 1-3 dashback. If you are able to adapt your technique, you can totally avoid this issue by using quarter-circle or frame-perfect pivots for grabs, fsmashes, jumps, etc. Dashback out of crouch is usually a pretty rare problem, and is mostly unrelated to the controller’s normal dashback. It’s a little bit subjective to test, but I included it because I’ve noticed it in some controllers. If you have any other issues with your controller such as sticky triggers, bad reverse needles/lasers, or shield drops, please stay tuned for a maintenence and repair guide! how “rough” the player is with his controller. Controller wear is important because high-tier dashback will never be present on a brand new controller. After a period of 3-12 months, a controller might “break in” and develop high-tier dashback, but it is likely that it NEVER develops it even with significant use. It’s hard to tell exactly how long to wait before “giving up” on a controller, but it should become obvious after a while that it’s just not improving. However, if the controller develops high-tier dashback without other seriously adverse side-effects, I would advise playing that controller until the dashback goes away or the controller breaks otherwise/becomes too loose to use. Once you realize that your main controller has great dashback, I would immediately buy a new one to begin breaking in so you don’t have to work with a bad backup if your main becomes unusable due to unforeseen circumstances. Likewise, if your analog stick still has tier 4 dashback after more than 6 months of regular use, I would recommend buying a new one to break in. And of course, if your controller has great dashback, I would highly discourage opening it or repairing it without exercising extreme care not to jostle the analog stickbox or potentiometer. In conclusion: Don’t obsess too hard about finding the perfect controller, because chances are it’s not the most significant factor holding you back. If you don’t have a controller with great dashback, always play on a controller on the newer side. As it breaks in and you become more familiar with how it works, hopefully the dashback will kick in after a few months. If you do find a controller with great dashback, try to split your time between that controller and another (newer) controller so you can preserve the longevity of the original while trying to develop a suitable backup. Thanks for reading! I hope you enjoyed the read and learned a lot. Mike “Typo” is an MBA candidate at William Paterson University, and currently uses controller modding to help finance his education. Starting with Shine 2016, he has been in attendance at major tournaments to provide controller modding services for as many people as possible during events. He also maintains a queue of mail-order services with his business Home Run Controllers (@HRControllers on twitter). Typo has modded controllers for top SSBM players such as mew2king, Mang0, Drugged Fox, Swedish Delight and has provided controllers for Lucky, KJH, Toph, Colbol MacD (All of whom are still currently playing them, as of 11/6/2016). You can follow his personal account @hrcTypo or business account @HRControllers on twitter. Super insightful and really easy to understand! Will be testing all my controllers soon! On ledge dashes. You only list one method of letting go of ledge (tilt turn). Would downward tilt seen here: https://i.imgur.com/uLFEqlg.png work as well? 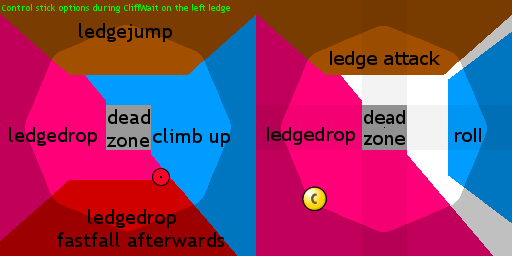 I’m wondering if this is more of a fast fall issue or angle that you jump in (neutral jump vs forward jump on frame 1 of jump input). Thanks, Typo, for the write up. I have a question concerning not the analog stick itself, but the cap. If there were a way to develop a heavier cap with the same dimensions as its nintendo counterpart, would this help aid in the “breaking in” process of a controller? I really want to know how a proper weighted cap can affect the analog stick over time. Thanks again! I have a controller that had great dashback but I opened it up to clean it, I cleaned the stickbox and potentiometer because they were full of dust, and now its dashback is awful, how can I fix it?